We started preparing for the Rallye Aicha des Gazelles last year, as soon as we made the decision to participate in the grueling nine-day off-road race across the Sahara. We knew from the start that the biggest challenge for us would be navigation — the event prohibits teams from using GPS, all navigation has to be done by map and compass. 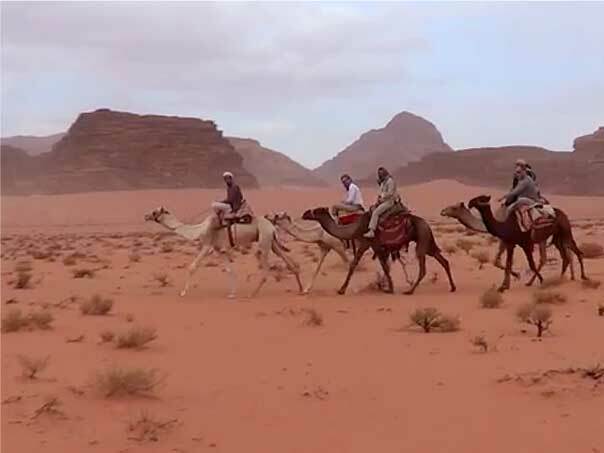 So to get a feeling for interpreting desert terrain, we headed out to Wadi Rum, in Jordan, where we spent a few days treking through the desert on camels with the Bedouin. These proud people have succeeded in integrating much of their traditional culture into the demands of a modern lifestyle. Their knowledge of this rugged landscape is encyclopedic. If we wanted to learn to really understand and feel the desert, they could help us develop our ability to see in another way. Our first lesson was about time. And timelessness. 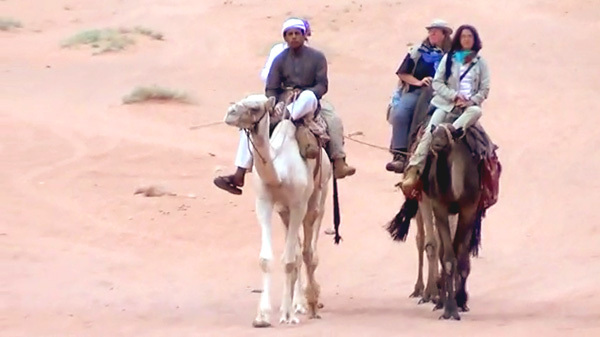 The pace here is set by the slow steady rhythm of the camels. They walk easily through the rocky sand and over steep dunes without faltering. We learn to trust them. These amazing animals don’t “break down” or “get stuck,” they overcome the desert’s challenges with a strange gracefulness. The bedouin chamelier (french for “camel handler”) leads them with a barely audible song, the soundtrack of centuries. The journey takes us into the most amazing landscape with sheer rocky cliffs surrounding us, and nothing but sand and camel grass in between. Initially we are struck by the “sameness” of it all. It is confusing to know where we are relative to anything because it all looks so similar. 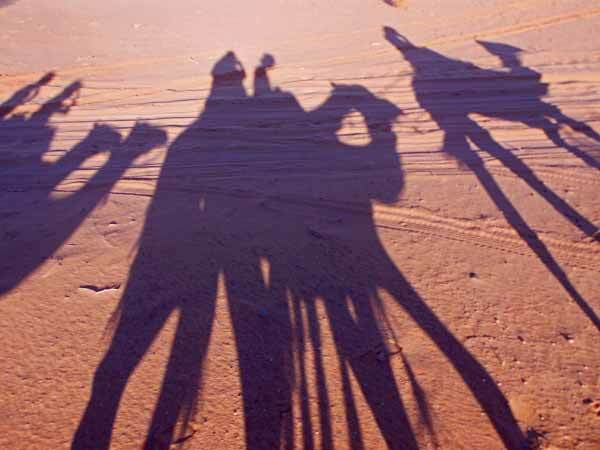 The shadow of the camels on the sand is our only indication of east-west, and without watches, we can just guess at the time of day by the length of the shadow. The sun and shadows begin to reveal something else as we get more comfortable with the desert. We start to see differences in the rock walls around us. Differences of relief and shape and size and profile. In the distance we can see a prominent pointy pyramid-like mountain. Our destination for the night is between here and there. 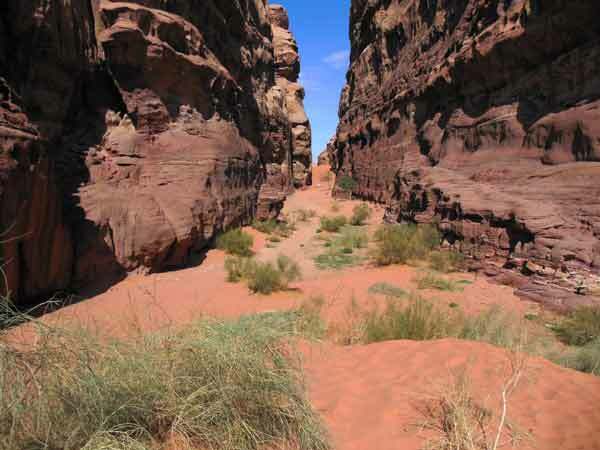 It is in the canyon in line with another rock formation that looks like two doors carved into a sheer cliff. We learn that as long as the “two doors” are centered under the “pyramid” we are following the correct heading. If they get off center, we need to adjust our path or we risk missing our comrades who have set up camp in a small cave nestled in the rock walls. Criss-crossing sets of tracks in the vast sea of sand present endless possible paths. Local wisdom says to follow the most travelled ones for the safest route. The camels stop to nibble on some grass and a decision is made to follow the tracks to the right. The chamelier sings on, and we move forward, content in the knowledge that we’d had a first lesson in “seeing” the desert. We are inspired by the harsh beauty, the fullness of a “barren” landscape that we find to be rich in color and sensations. The camels’ rhythm is now our own. We become one with the landscape, as if we “belong” here despite our foreign-ness. 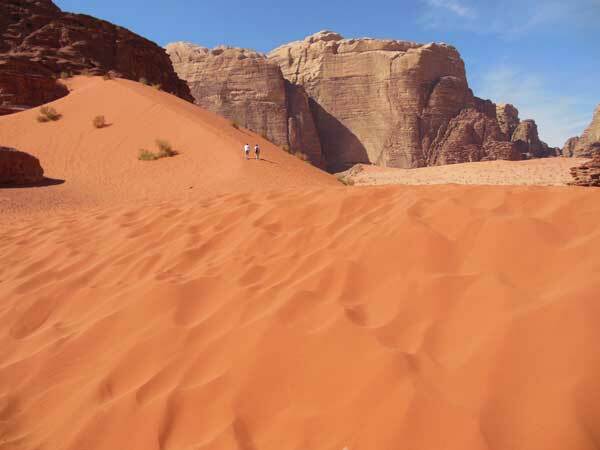 Wadi Rum is a valley cut into the sandstone and granite rock in southern Jordan 60 km (37 mi) to the east of Aqaba. 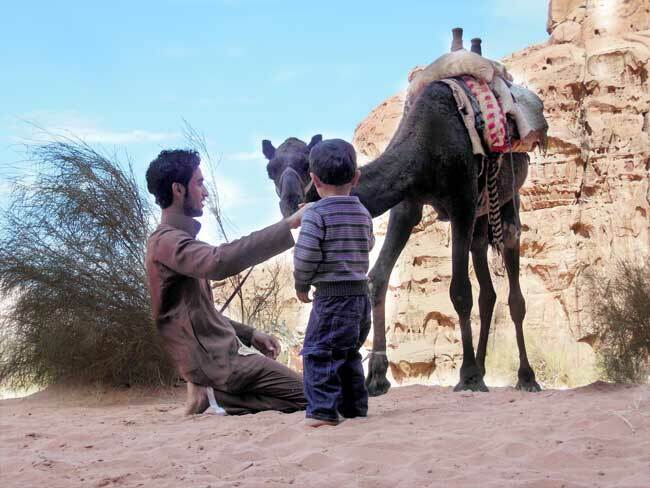 The area is inhabited primarily by the Zalabyia bedouin, who have developed a successful eco-tourism industry centered around climbing. The main attraction for climbers is Jabal Rum (1,734 metres (5,689 ft) above sea level), the second highest peak in Jordan. Wadi Rum is easily reached from Aqaba, Jordan or from Eilat, Israel, though arrangements for local transportation must be made in advance. The best time to visit is early spring or late autumn.